“Focus & Finish” was CHS alum Ralph Starkey’s motto when speaking to youth and civic groups throughout his career. And that was his passion in his pursuit to make the Mary Virginia Crites Hannan Park the very best it could be for the citizens of Circleville and Pickaway County. If you have not visited the park you surely should make that a must stop. You will be impressed by all the facilities that provide accessibility to all youth and adults, physically challenged or not. The playground, the splash pad, the shelter houses, the Starkey Pavilion, the 1.1 mile paved track, the ½ mile gravel trail through the woods, the butterfly garden, the wetlands observation deck, a water fountain that includes a pet fountain,and, most recently the dog park where dogs of all sizes can play were all placed in the park with the requirement that they be accessible to all. 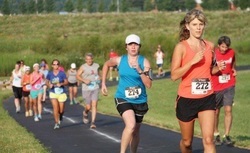 Each year, on the 3rd Saturday in July, your Circleville High School Alumni Association sponsors The Roundtown Classic - a 5 mile and 5K run/walk which takes place within the park. This is our largest fundraiser of the year. It provides the funds to award $1000 scholarships to selected graduating family members of Circleville High School Alumni. The alumni association also funds other school related projects, activities, and needs. The Information Station was completed and dedicated in the Spring of 2014. There was no central place within the park where folks could go to see what events will be taking place there, or to see the results of events such as The Roundtown Classic or other races. The Information Station, located near the butterfly garden, was financed by several groups, organizations, and individuals.